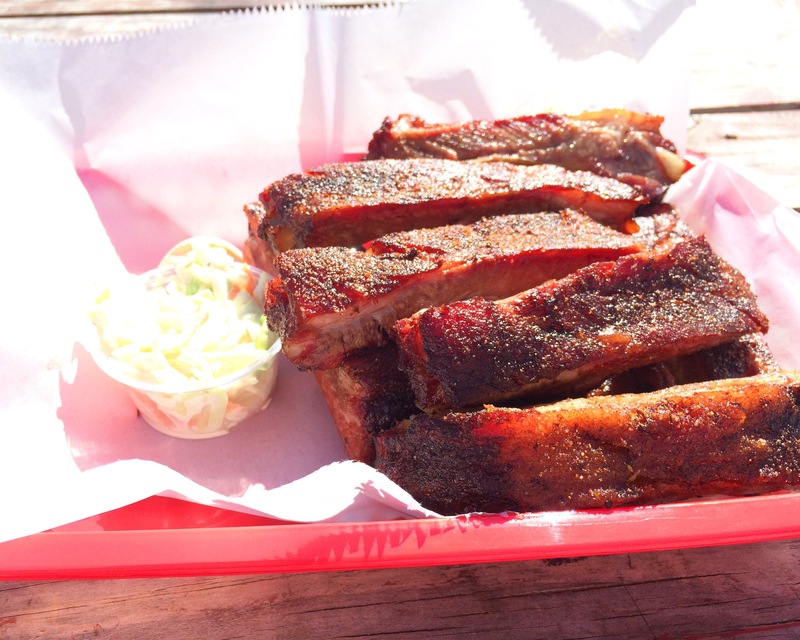 Eli’s BBQ – Go There. Try That. 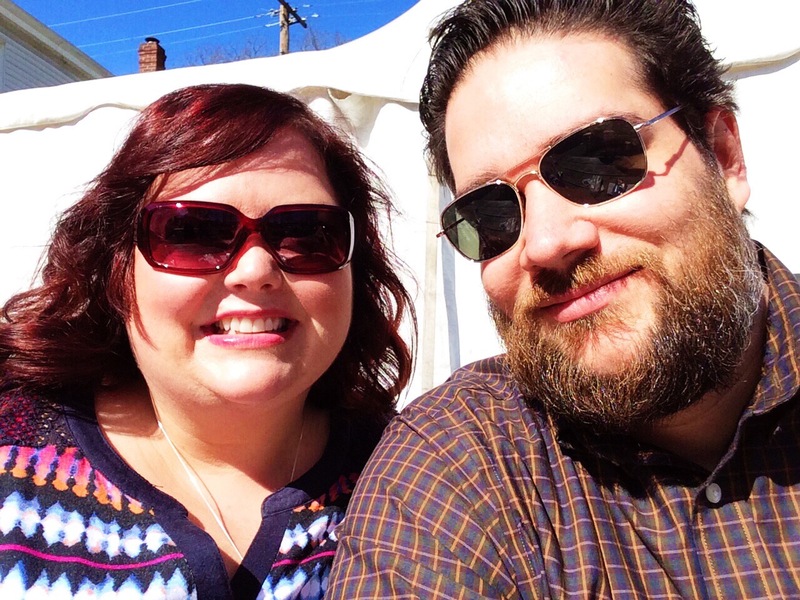 I’ve actually been sitting on this post since I started this blog almost a year ago. See, I love Eli’s. We’ve been dining there since their Riverside Drive location first opened. So why haven’t I written about it yet? Why am I hesitant now? Because I assume, at this point, that everyone else knows about Eli’s and, like me, already loves Eli’s. It’s kind of become an Eastside phenomenon. But, you know what they say about assuming . . . And if this is a blog celebrating local, independent, high quality goodness, I have to talk Eli’s! First of all, I love the success story of Eli’s BBQ. Elias Leisring, local Cincinnati guy, sets up pop-up stands on weekends, works hard, eventually opens his own restaurant (Riverside Drive), does so well he adds tents outside to accommodate seating, and then, coming full circle, opens a second, storefront location at Findlay Market where he started as a pop-up vendor. I remember times, early in, when Eli’s would run out of a particular meat; now, he has multiple smokers! What did Aesop say? Slow and steady wins the race! 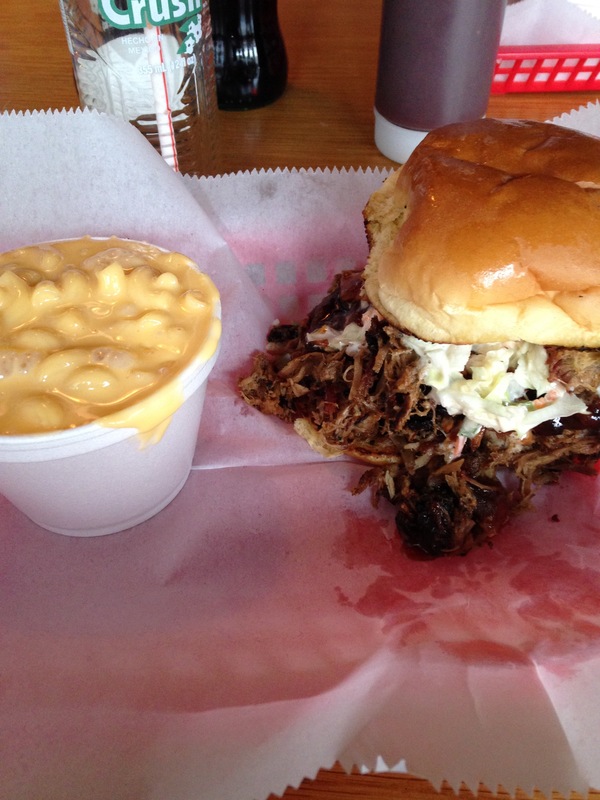 When talking barbecue, certain sides are mandatory: Baked Beans and Macaroni and Cheese for example. 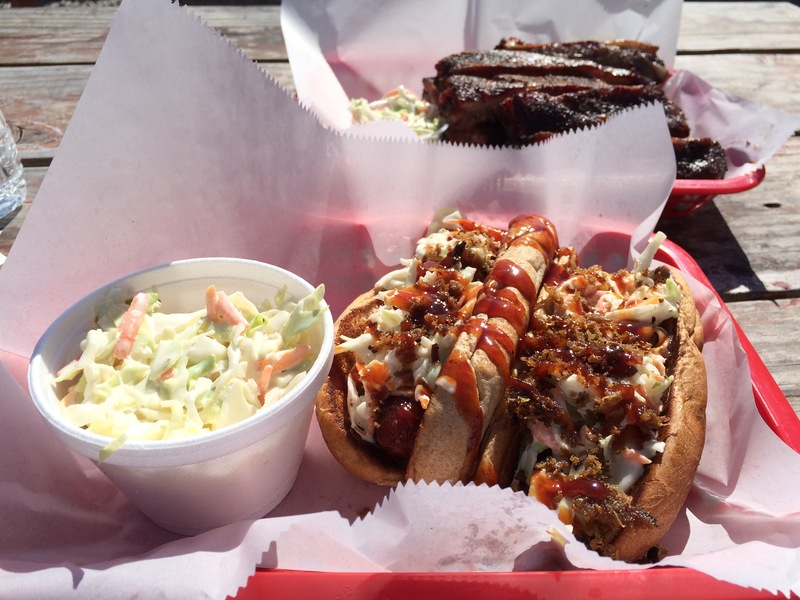 Eli’s serves up these barbecue staples and more. Friends of mine swear by the Cheesy Jalapeno Grits. I can’t speak for these because I’m not a grits person, but I trust their judgement. My faves are the Creamy Southern Slaw and the Mashed Potatoes. I’m a huge cole slaw fan, but some slaws are too drenched in mayo- not the case here. And, I wouldn’t actually call these Eli’s potatoes mashed potatoes, at least not by the traditional standard. This is more like a potato pancake in the sense that the potatoes are flattened down and grilled with butter. Yummy. Let’s talk meat! Eli’s is a carnivore’s dream! The sides are fine, but it’s all about the meat baby! I have several recommendations, but it’s all good! Ribs: These are dry rubbed and smoked. The skin is caramelized and crispy and the inside is tender. Jackpot! My husband always says good meat doesn’t need to be drenched in sauce. He loves the ribs at Eli’s as is. Me? I grab a bottle and add a little extra secret sauce on top simply because I love the homemade barbecue sauce here. However, the meat really is good enough that the sauce isn’t necessary. Two all beef hotdogs: These are not your backyard barbecue hotdogs! I never ever would have ordered hot dogs when ribs are an option; luckily, my husband decided to give it a try. These bad boys are all beef franks with barbecue sauce, cole slaw, and, most importantly, pork crispins! Did you catch that? Let me repeat. Topped with pork crispins! It’s sinfully messy and gloriously good. I’m convinced this combination was divinely inspired. Pulled Pork Sandwich: I love that the pork has a bit of spice and smoke, but it doesn’t overshadow the meat. Again, the pork is tender. This sandwich, topped with Eli’s signature sauce and that Creamy Southern Slaw, is perfectly satisfying. Eli’s is a small restaurant with a focused menu. If there’s not enough room inside, no worries, eat picnic style. 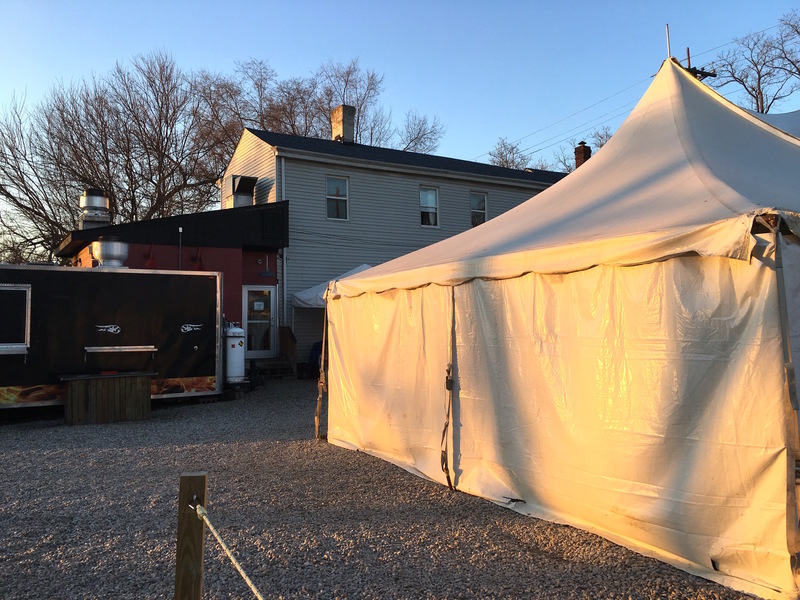 The tents outside have heaters during the winter months. They don’t serve alcohol, but if you want to bring an adult beverage, pack a cooler and have at it. Eli’s does serve pop (in bottles), but there aren’t free refills. It’s sort of nostalgic and cool- eating barbecue while drinking a Coke out of a glass bottle! When the weather is nice, we love to take friends, bring drinks, sit outside, and enjoy our food. It’s an awesome picnic without having to cook anything! Perfect. Eli’s is definitely a repeat venue for us. If you have favorite Eli’s menu item, please share! I’d love to hear! 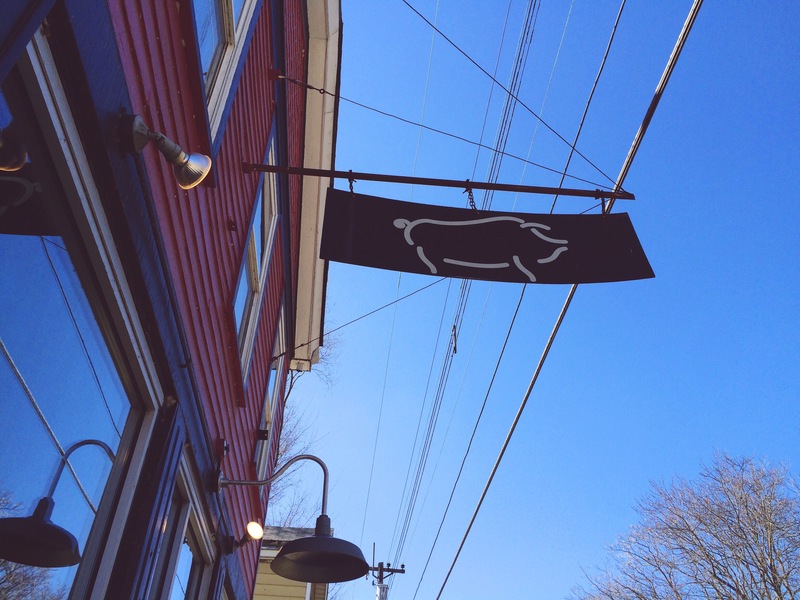 GO THERE (Eli’s BBQ)! TRY THAT (ribs, all beef franks, pulled pork sandwhich)! Houdini's Room Escape (and Giveaway) Island Frydays! I cooked a lot.. and while retired I gt a nice grill/smoker. However.. Eli’s does BBQ so GOOD it’s one of not many places I go out to eat. Now, they do take plastic, and with a sandwich the Slaw/sauce is included in little bowls. I find the cornbread dry. Too bad, nice flavor. Jalapeno Grits.. made me LOVE grits. Not a big menu but what they do.. they do good. You can do a bunch of triks with beans, slaw,BBQ sauce….. but I want that stuff to be ” Best ever church picnic” and not whatever “trendy” twist. The ATMOSPHERE is great in that is….is pretty accidental. It ain’t no chain and you’re paying for the FOOD not the frills.